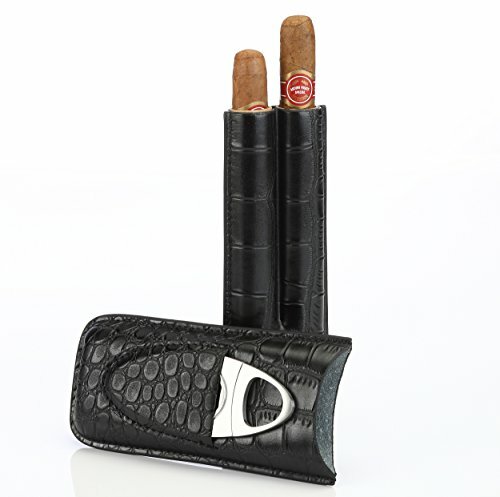 The Black PU Leather Cigar Holder is for every cigar lover who needs to protect their cigars during an outing but can't find one that looks classy. Here's a huge problem you face right now. You don't take your cigars with you because you're not sure how to protect them during your outings or while traveling. What makes this even worse is the fact that your cigars will break or bend if you store them in your pocket! Which means you can't use them and they won't be with you when life gives you an opportunity to enjoy a smoke. All of this can make trying to carry cigars with you wherever you go a nightmare! But luckily for you, there's now a solution! So, if you're a cigar lover who really wants to have your cigars on hand, but not sure how, we have the answer you've been looking for. This amazing new leather cigar case with cutter is a perfect fit for a shirt or jacket pocket, a golf bag, or a carry-on bag for traveling. It keeps your cigars protected so they don't bend or break. Nicely crafted design makes it easy to look great. Free cigar cutter easily cuts through cigars. Don't wait any longer to have a cigar with friends! Order Now! NICELY CRAFTED ALL PU LEATHER DESIGN! This cigar travel case is great looking, sturdy, and durable. It keeps cigars well preserved during the day and when traveling. GETS THE JOB DONE! Sharp and durable cigar cutter provides you the ability to easily cut through cigars and remove ends. Cigar holder assures your cutter is always with you. EXTREMELY EASY TO USE! Simply slide a couple of cigars of pretty much any length into the case. Even works with e cigars (electric cigars). CLASSY & ELEGANT LOOK! Makes a perfect gift set for every cigar lover. Gives both a classy and experienced look at the cigar bar or lounge. FUNCTIONAL! Perfect size gives you the flexibility to use the cigar accessories wherever you want. Fits great in a shirt or jacket pocket when having a cigar with friends. Put in the golf cart or bag for your next outing. Works well for traveling. No cigars included. If you have any questions about this product by Cachet Cigar Co, contact us by completing and submitting the form below. If you are looking for a specif part number, please include it with your message.